Get new patient cases and exercises as they are developed, and store recorded sessions in the cloud. The core simulation engine is open source, meaning you can have it customised or extended by third-party developers. The Kobra simulator is in use at the dental schools of two leading European universities and has been the subject of studies at Karolinska Institutet and the Royal Institute of Technology. The Kobra simulator was developed with the user in mind. We have collaborated with oral surgeons at Karolinska Institutet in Huddinge to ensure that it aids in important aspects of teacher-student interaction. Kobra consists of state-of-the-art haptic technology and 3D stereoscopic viewing, paired with a flexible system of adding new patient cases that is customised to your needs. A custom-made haptic device lets you feel interacting forces when drilling or exploring the virtual patient’s anatomy. Various tissues such as bone, enamel and dentin can be represented by different degrees of hardness. The Kobra simulator’s core haptic technology is open source and available for customisation. External developers can use the code and improve it for their needs — improvements which are brought back for the benefit of all platform users. 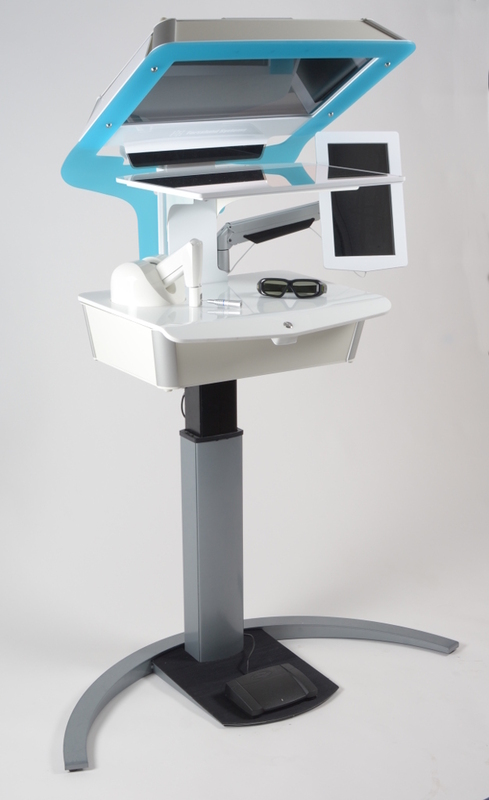 With the included 3D glasses, you and your students can simultaneously view the virtual patient in full-screen 3D. There are a growing number of patient cases available for the Kobra simulator. New ones can be created on demand. Jonas Forsslund, Ph. D. is demonstrating the new Kobra oral surgery Simulator, including some video footage from the simulation itself. If the video is unavailable, please try to download it or contact us. Four Kobra simulators have been in use at Riga Stradiņš University in Latvia since spring 2013. The Kobras used in Riga were the first generation of our simulator. In honour of our Swedish heritage, the first generation Kobras were built of wood, making them beautiful pieces of furniture. Kobra is an integral part of the Medical Education Technology Centre (METC), one of the first intellectual innovation hubs for medicine and healthcare in the Baltics. As part of our effort always to improve, we have interviewed students and teachers who are using Kobra in order to make the next generation of the simulator even better. In May 2016, Forsslund Systems delivered an updated Kobra simulator to the University of Erlangen in Germany. Interestingly enough, at this university the faculty must pitch new purchases to the students. This means it is the students who decide what new teaching equipment the school will buy, and they voted for the Kobra simulator. The updated version of Kobra includes a height-adjustable stand, making it easier for students of all heights to use it comfortably. The software was also updated to enable Kobra to be used in places without an internet connection. Would you like a custom quote? Are you interested in modifying the simulator to your own unique idea? Would you like to test it yourself in Stockholm? Let us know!